Canterbury Weather Updates is the only professional weather forecasting agency in New Zealand, with a sole focus on one region. Our eyes are fixed on the Canterbury region, meaning we’re able to provide the most detailed & comprehensive weather coverage available for Canterbury. 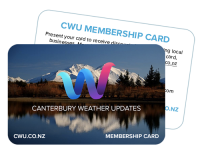 Not only will you receive extra confidence and clarity with our weather content you’ll also open the door to hundreds of dollars worth of special discounts, exclusive benefits and fantastic services with your CWU membership. Unmatched coverage for the Canterbury Region. 1 to 7 day forecasts for 27 locations across the region. All moderated content, highly accurate, detailed and comprehensive weather information at your finger-tips. Rainfall chances, rainfall totals and snow levels & accumulations – we cover it all. Alpine roads forecasts, mountain forecasts and the most detailed long-range information available for Canterbury with our Monthly Outlooks. Warning information, with outlooks, watches and warnings with unmatched detail and intensity for the Canterbury region. New and exciting – not only will you receive the most detailed and comprehensive weather coverage for Canterbury you’ll also enjoy a range of discounts and benefits. Check out the list below weekly for new additions. Support local and receive great discounts. SAVE WITH YOUR CWU MEMBERSHIP AT PORTERS. Porters is the closest ski area to Christchurch, with a short access road, fantastic learner slopes and a mountain of terrain for experts! Porters is offering 20% off adult weekday lift passes, available Monday-Friday (excluding July school holidays) to CWU members. Just present your CWU membership card when purchasing your pass at Porters. At the Hanmer Springs Thermal Pool & Spa. SAVE WITH YOUR CWU MEMBERSHIP AT THE HANMER SPRINGS THERMAL POOL & SPA. The best place to escape, Hanmer Springs Thermal Pools & Spa is an easy drive, just 90 minutes north of Christchurch. With a range of pools including relaxing rock pools, soothing sulphur pools, an array of water jets and bubbles - at a range of temperatures. Plus a luxurious day spa with a range of treatments, private pools, sauna and steam rooms. Adult single entry $25.00 - $20.00. Child single entry $12.50 - $10.00. Senior single entry $18.00 - $14.00. Mini group single entry* $62.50 - $50.00. *A Mini Group consists of 2 Adults and up to 3 children aged 3-15 years. SAVE WITH YOUR CWU MEMBERSHIP AT CLOUD 9 FLOAT CLUB. $80 PER FLOAT. USUALLY $95. At Cloud 9 Float Club we are passionate about giving you the opportunity to escape the pressures of everyday life. We provide a safe and nurturing space where you can truly rest, relax and recharge. When making a booking online enter "CWU Members" in the notes section or phone 03 341 8331 anytime and we can help you out! • Skin care products, hair dryers and GHD’s are provided in our groom/vanity room. SAVE WITH YOUR CWU MEMBERSHIP AT SPAGALIMIS IN THE CITY. Spagalimis Pizzeria is a Christchurch institution. We are the oldest restaurant in town and one of the oldest in the country. For over 40 years we have been serving our delicious pizzas to locals and visitors alike. Enjoy 25% off your total bill when you dine in at our restaurant on the corner of Salisbury and Montreal street. Parking is off 381 Montreal. We are proud to be working with Canterbury Weather Updates to bring you great pizza and fantastic weather information. See you soon! SAVE WITH YOUR CWU MEMBERSHIP AT FURTHER FASTER. FurtherFaster is Canterbury's best store to come to if you like to trail run, tramp or paddle even better if you are an adventure seeker with your dog. We stock a lot of premium brands which are perfect for the Kiwi Outdoors. Our store is open at 57a Buchan St Sydenham, so bring yourself and your dog in to get kitted out. Excluding food items & discounted products. SAVE WITH YOUR CWU MEMBERSHIP AT THE FEED SHACK. The Feedshack Rangiora and The Feedshack Bishopdale are locally owned and operated pet supplies stores specialising in natural food and quality accessories. With years of experience and only the best available for your fur baby The Feedshack stores have the largest selection of natural treats and award winning food in Canterbury. On all products using the coupon code. SAVE WITH YOUR CWU MEMBERSHIP ONLINE WITH YUMMY & NUTRITIOUS MEALS/SNACKS. Go Native World meals deliver high protein and convenient ready to eat meals. Good enough to eat at home and on your next adventure. If you are serious about adventure you need to be seriously fuelled. It's not dehydrated, it tastes good and has a high protein value that you can eat hot in 2 mins or cold in emergencies. To claim your discount code - head to the My Account page. SAVE WITH YOUR CWU MEMBERSHIP AT HANMER PITCH & PUTT. Hanmer Pitch and Putt golf course is an excellent destination for everyone. Golfing beginners can enjoy the relaxed atmosphere while advanced golfers can sharpen their short game. Families can come and enjoy the course with time out in our picnic areas. It is also a great location for corporate events, weddings and parties. SAVE WITH YOUR CWU MEMBERSHIP AT PORTERS LODGE. The Porters Lodge has comfortable, bunk-style and family accommodation set against a beautiful mountain backdrop. We have a fully licenced bar and serve freshly cooked hot meals and snacks. We're nestled at the base of Porters Ski Area in the Craigieburn range, so perfectly located whether you're here for the biking, hiking, the stunning views or simply passing by. Drop in and say hello! SAVE WITH YOUR CWU MEMBERSHIP AT PUREPODS. A PurePod stay is like no other experience. It is a beautifully romantic getaway, in a luxurious glass eco-cabin, complete with glass roof, glass floor, three walls all of glass with big wide sliding doors and decking. Every PurePod location is distinct with dramatic landscapes and stunning views. The PurePods are solar-powered, operating fully off the grid, deliberately free of a wi-fi connection and furnished with a fully equipped bathroom, kitchen and luxurious queen-sized bed, perfectly designed for a maximum of two people. There are six unique locations to choose from throughout Canterbury, including inland Kaikoura, Greta Valley, Waipara and Banks Peninsula. To claim your discount code head to your 'My Account' page and follow the simple instructions. SAVE WITH YOUR CWU MEMBERSHIP AT THE TEA KIOSK CAFE & GRILL. Whether you’ve been relaxing in the pools or racing down the SuperBowl, the Tea Kiosk Café & Grill is the perfect spot to take a break and grab some refreshments. SAVE WITH YOUR CWU MEMBERSHIP AT BACON BROS.
Bacon Bros started here in Canterbury back in 2011 and offer the most delicious range of burgers and free hugs. Located at the Christchurch Farmers Market at Riccarton Bush and Little High Eatery on High Street. SAVE WITH YOUR CWU MEMBERSHIP AT 8 ON OREGON IN HANMER SPRINGS. Set high on Conical Hill, 8 on Oregon is a boutique lodge offering panoramic views that stretch from inside your room, across Hanmer Springs to the mountains and farmland beyond. It is the stunning hillside location along with the extra personal care and attention provided by your hosts that is this small boutique lodge's real point of difference from other accommodations in the town. 8 on Oregon is the perfect place for CWU members to come to relax and take in the magnificent alpine setting which comes complete with ever-changing colours, hues and weather patterns. Jill and Dave are pleased to be supporting CWU and look forward to welcoming members who book a stay to their piece of alpine paradise. Any full priced treatment & products. SAVE WITH YOUR CWU MEMBERSHIP AT THE ARTISAN SPA. Your skin is as individual as you, Your skincare should be too. As our name suggests, every Artisan treatment is crafted to leave you feeling refreshed, renewed and at your glowing best. Quite simply, we are the experts in tailored treatments which revolve around you. Our down to earth and knowledgeable therapists have decades of hands-on experience combining the best of science and nature to create beautiful skin, offering specialised therapies including dermal planning and collagen induction that you won’t find in your average spa. SAVE AT LIFESTYLE IRRIGATION WITH YOUR CWU MEMBERSHIP. Lifestyle Irrigation is locally owned and operated by Andrew and Anita Hattrill specialising in residential, lifestyle and small farm water solutions. We offer solutions by way of consultancy, design, supply, installation, after sales service and maintenance for anything water. We attend to any water problem whether it requires treatment, new setup, automated springer system, supply water from source to house, garden, livestock, nursery and more.